An indulgent macaroon (coconut cookie) recipe for crispy on the outside, soft and chewy on the inside cookies with great coconut flavor. These are simple, tasty, low in sugar for a cookie. They are also gluten free. Plus they've easy to make ahead and freeze baked or unbaked. What's not to love? Using unsweetened coconut makes this recipe even lower in sugar while still satisfying your sweet tooth. For the coconut I used sweetened, half shredded, half flaked. You can use whatever combination you want. Beat the egg whites slightly, when they start to whip up and get some air add the other ingredients and stir until well coated. It's that easy. Line a cookie sheet with parchment paper and shape your macaroons, they don't spread too much but don't put them too close either. I use a #30 (3 Tbsp) scoop and fill it until it's heaping. Bake until golden brown, about 15-20 minutes, let cool for 5 minutes before eating. A cooling rack works best but you can also slide the whole sheet of parchment paper and the cookies off the sheet onto your counter or table. Original recipe and inspiration from Sarah's Musing. Freezing Macaroons Coconut cookies can be frozen after they are baked just let them cool, wrap them and freeze. They thaw just fine on the counter. Unbaked macaroons also freeze well but will be sticky even when fully frozen. Line a cookie sheet with waxed or parchment paper, scoop out the cookies just so they aren't touching each other and freeze for an hour or so until they are hard. 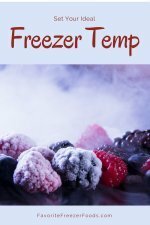 Move them to a plastic bag or rigid freezer container for storage. Bake from frozen just adding a few minutes to the baking time. Remember to add your macaroons to your freezer inventory sheet. 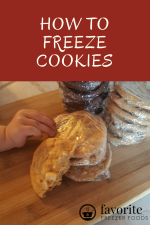 Learn more about how to freeze cookies. Got questions? Ask me your freezer cooking questions and get answers. 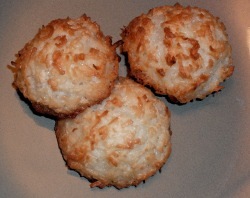 Return from Macaroons Coconut Cookie Recipe to the homepage of Favorite Freezer Foods.